VeggieTales is an American series of children's computer animated films featuring anthropomorphic vegetables in stories conveying moral themes based on Christianity. They frequently retell Biblical stories, sometimes anachronistically reframed, and include humorous references to pop culture in many different eras by putting Veggie spins on them (e.g., classic literature, TV shows, etc). The series was developed by Big Idea Entertainment. VeggieTales was created by Phil Vischer and Mike Nawrocki, who also provide many of the voices. Originally released in direct-to-video format, the series debuted on December 21, 1993. From September 9, 2006 to September 5, 2009, VeggieTales was featured on the children's programming block called qubo on NBC. As of 2009, the TV show is shown on Gospel Music Channel. The series has still been releasing new episodes on DVD while the television show airs. 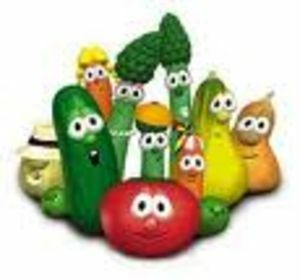 VeggieTales has also published books, music CDs and branded items such as toys, clothing, and garden seeds for vegetables and flowers (e.g., daisies, fern, tulips, pumpkins, squash, peas, scallions, sunflowers, etc). As of 2012, VeggieTales will be shown on the BBC's digital preschool programming channel CBeebies. VeggieTales was created by computer animators Phil Vischer and Mike Nawrocki through their company Big Idea Productions. Their aim was to produce children's videos which conveyed Christian moral themes and taught Biblical values and lessons. The animated feature involved stories told by a group of recurring vegetable characters who lived on a kitchen countertop. The program was offered in the direct-to-video market, with the first 30-minute program, Where's God When I'm S-Scared?, released in July 1993. In all, Big Idea has released 45 VeggieTales episodes including three Silly Song collections, 5 holiday specials, 4 LarryBoy episodes and a drawing tutorial. In addition to these episodes, there are 13 compilations that combine previously released material, and two feature length movies, Jonah: A VeggieTales Movie and The Pirates Who Don't Do Anything: A VeggieTales Movie. Beginning in 2006, the VeggieTales videos were adapted as a regular television program through the Qubo multi-platform network and NBC network. On September 30, 2008, Big Idea said that Mike Nawrocki would create an "original new VeggieTales TV series," though no further news has been revealed. The idea for VeggieTales came in the early 90's when Phil Vischer was testing out animation software as a medium for children's videos. Due to the limitations of the software available to him, he chose to avoid the technical production hurdle of creating characters with arms, legs, or hair. His first animation model on the software was an anthropomorphic candy bar, but after his wife suggested that parents might not want to show their children videos with a candy hero, he instead chose to use fruits and vegetables, their polar opposite. The episodes generally follow a standard format where a moral issue is posited in the opening countertop sequence, either through a viewer letter (as of 2009, video e-mail is used instead of letters) or because of something brought up by Bob or Larry, followed by one or more "films" that address the issue, with a silly song in the middle. Often Larry, Jimmy & Jerry Gourd, Archibald, or The French Peas will show short videos in an attempt to address the issue only to be saved in the end as Bob introduces the main story. The Silly Songs are generally introduced with a title card and the voiceover saying, "And now it's time for Silly Songs with Larry, the part where Larry comes out and sings a silly song." Some silly songs have alternate titles, such as "Love Songs with Mr. Lunt," where another character sings the song instead. The Silly Song, if one appears, is always in the middle of the program, often at a cliffhanger moment. The LarryBoy episodes, in particular, lack this segment. The television show altered the general format by opening with Bob greeting kids and inviting them over to his house. Then Bob, Larry, and other characters (Archibald Asparagus, Junior Asparagus, Mr. Lunt, Pa Grape, and Jimmy Gourd) sing the show's theme song as they hop to Bob's front door. The theme song ends with a character making a random comment, such as Pa Grape commenting on Archibald's new sweater. The television show opens in Bob's living room where Bob says "Hi kids! Welcome to VeggieTales!" Followed by Larry saying "On TV!" The two wait for the mailman, Jimmy Gourd, to deliver a letter. When Jimmy comes, he happily sings his Mail Song, which Bob and Larry both find tedious. Then instead of handing the letter to Bob and Larry, he insists on cramming it through the mail slot. Bob and Larry read their letter and try to decide how to solve the viewer's problem. One of their neighbors comes in and attempts to solve it, followed by one of three regular segments: Archibald reads a story from his Big Book of Oddities (which he got from Oprah's Book Club), Pa Grape shows an old film, or Mr. Lunt appears as Paco the Storytelling Mule (a stick puppet) and tells a story. The result always proves disastrous, as the story or film makes no sense. Bob and Larry then intervene with a story from a VeggieTales episode to solve the problem. The show ends with Bob and Larry wrapping things up by reiterating the story's lesson and thanking the kids for coming to his house. The closing credits then start to be shown. When the show aired on NBC network television in September 2006, VeggieTales episodes were edited to remove most references to God, at the request of the NBC network's standards and practices department. The religious references remained intact in the closed-captions accompanying each episode. Notable was the removal of the program's signature sign-off message: "Remember kids, God made you special and He loves you very much." Despite this, Bob and Larry would always say "Goodbye!" at the end. The Christian conservative watch group Parents Television Council complained about the removal to NBC. NBC replied that the editing conformed to the network's broadcast standards of "not to advocate any one religious point of view." Vischer also expressed discontent with the edits, stating that he was not informed that religious content would be removed from the series, and he would have refused to sign a contract if he had known of this beforehand. Vischer said, "I would have declined partly because I knew a lot of fans would feel like it was a sellout or it was done for money." Still, Vischer added that he understood NBC's wish to remain religiously neutral, and said, "VeggieTales is religious, NBC is not. I want to focus people more on 'Isn't it cool that Bob and Larry are on television.'" Bozell wasn't satisfied about the broadcasting. He said, "If NBC is so concerned about that three-letter-word God, then they shouldn't have taken 'VeggieTales.' This just documents the disconnect between Hollywood and the real world." In 2009, Netflix, the DVD delivery and streaming video service, made many VeggieTales feature films and television episodes available via Netflix's video streaming service. Original and even more recent episodes and full length features are uncut, in their original format.